The mosaic pond filled with water but with the fountain off on 9/21/02. For my thirtieth birthday, in September of 2002, my mother bought me this mosaic pond. It came from American Pools and Fountains, Inc. which must have gone out of business as their web site is now on gambling! I have yet to bail it to determine the exact gallonage but it is about 20 gallons. It is supposed to be buried in the ground. The plug is an AC adapter that is huge and will not fit into my outdoor outlets so I am not sure what to do about that. I am also not sure how to go about finding edging stones or rocks that will hide a circular pond formally. I welcome any suggestions. For now, this pond would stay inside until spring. The ground was rock solid from the worst drought in our recorded history, and I hoped it was soaking wet next spring. I had seen this pond and loved the mosaic but would not buy it for myself as it was way too expensive. This pond is really for people to admire and not for plants or animals which would hide the mosaic. I might put a few small fish in it next year. We shall see! On 3/28/03, I decided that this pond should stay on the porch due to the outlet problem. I would probably not put in anything but maybe some guppies. Being in the shade of the porch, plants would not grow well. I set this pond up on the porch on 4/2/03 on the front porch. It looked neat at night since it was lit up. There was no way to turn off the light if the pump is on [Update: The light did not last long before it burnt out). 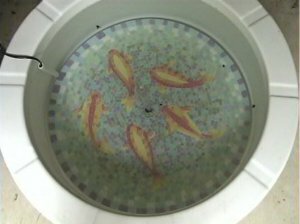 I added four guppies (3 female, 1 male) on 4/12/03. They hid under the mosaic most of the time! I also put in a piece of mosquito dunk the week before but, with the guppies in there, I probably would not need to add any more. Photos are on the guppy page. 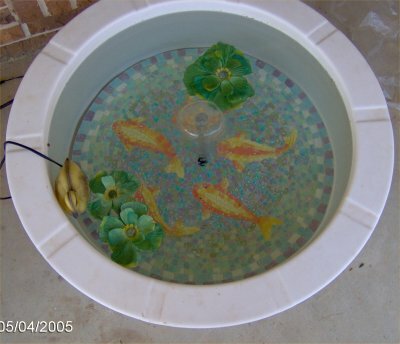 The poor guppies were found dead a few weeks later when I lifted the mosaic. It was apparently too cold for them. The pond become full of suspended algae despite being out of the sun, under the porch. I added an old copper sulfate algae killing block I got free but would never use in a pond with life in it. It took a few weeks, but since then, the pond was clear due to the block. It was kind of boring with no plants or animals in the pond though! My mother wanted fish in this pond so I put in a pair of paradise fish on 6/13/03. I added an old driftwood piece on slate and a large fake floating plant. I dumped the water, filled it 70% with 1800 gallon pond water, and the rest new water. I added the right amounts of salt, Stress-Coat, Stress- Zyme, Aquari-sol, and MelaFix (the last two for a week). I fed the paradise fish well. They promptly took up residence UNDER the fake mosaic. This pond is not meant for fish! They sneak out after dark only to eat. More on them is on my paradise fish page. They would come in in the fall when the pond comes in since they are semi-tropical fish. On 6/30/03, the male made a bubble nest! The female was egg-laden. Alas, the nest fell apart. I was sure they would try again. He did make many more nests, one every few days. On 7/19/03, I could have sworn I saw a fry in the pond but never saw one again. Maybe I hallucinated! Nope, I saw him again on 7/26/03 after cleaning the pond. I even held him in my water-filled hand! He was real! The fish had to be at least a few weeks old and was sluggish. I was worried the little one did not make it but again cleaned the pond and held him in my water-filled hand on 8/9/03. Now, I could see red and blue stripes so the baby was definitely a paradise fish! The raccoons kept taking the stuff out of this pond so, if the fish had not been able to hide under the mosaic, they would have been dead! So, I should not have complained about that! On 3/27/04, I set the pond back up but with no life so far. The algae took over by 4/30/04 so time to clean! I used AlgaeFix, and it worked well. I was not sure yet what, if any, fish I might put in there this year. On 6/6/04, I added two shubunkins to this pond to quarantine until fall. See my July 2004 Pond Newsletter for more details on them and how they were faring. On 7/11/04, I found one dead that had jumped out. I was upset. I netted the other one out and put him in my 1800 gallon pond before he too jumped. On 4/2/05, I set the pond back up with no animals or plants, just empty. I put the pond up on 10/2/05. On 4/2/06, I set the pond up without any animals or plants again. I put it up that fall. 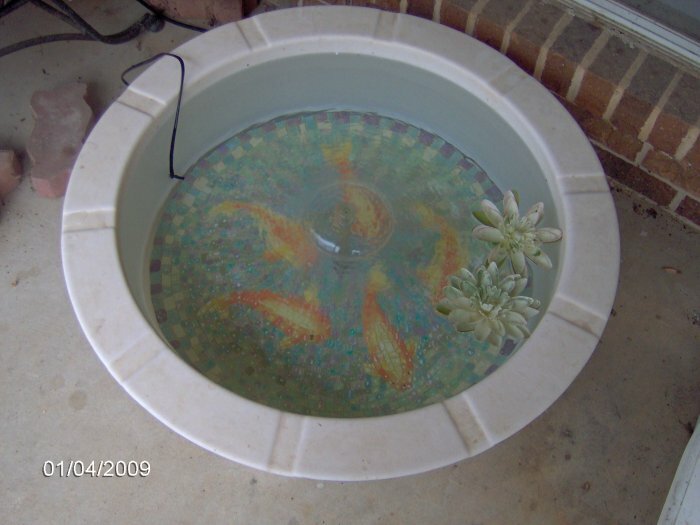 On 3/29/07, I set the pond up again on the front porch without plants or animals. I put up the mosaic pond for the winter on 9/23/07. On 3/30/08, I set up the mosaic pond on the porch. I put the pond up on 9/15/08. On 4/1/09, I set up the mosaic pond on the porch. On 9/20/09, I put up the mosaic pond. 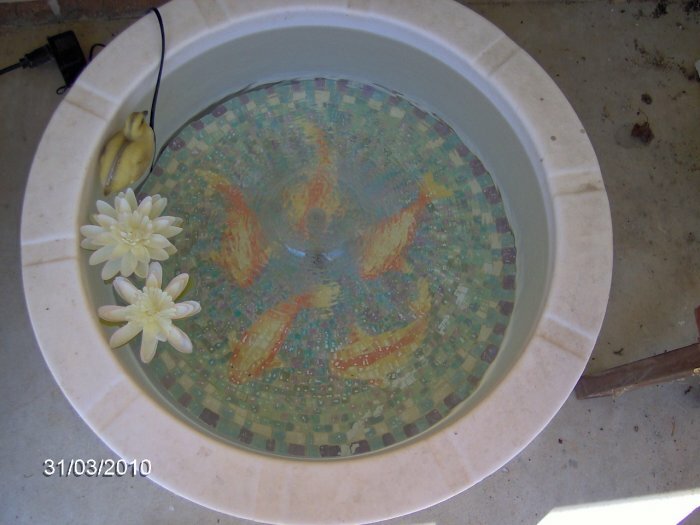 On 3/31/10, I set up the mosaic pond on the porch. Mosaic pond - set up on the front porch on 3/31/10. I put up the mosaic pond on 9/18/10. On 4/3/11, I set up the mosaic pond on the porch. I put up the mosaic pond on 9/18/11. On 3/18/12, I set up the mosaic pond on the front porch. I put up the mosaic pond on 9/12/12. On 4/3/13, I set up the mosaic pond on the porch. The cords no longer bend where I want them to so they will not go down the trough made for them so the mosaic no longer can sit flat. I put up the mosaic pond for the year on 9/2/13. The raccoons had really made it dirty. On 3/27/14, I set up the mosaic pond but did not add water or power yet. On 3/30/14, I added water and got the pump going. I put up the mosaic pond for the year on 8/31/14. I set up the mosaic pond on the porch for the season on 4/8/15, the latest ever. I put up the mosaic pond on 9/6/15. I am not sure if I will ever set it up again. The colors have faded. The raccoons just use it as a bath so it is always filthy. They broke the fountain head in two places now. I decided not to set up the mosaic pond in 2016 for the above reasons.